The GIGABYTE BRIX gives you enough power to handle everyday computing with minimal power consumption and minimal effort. The Intel Haswell powered system comes in a number of choices up to a dual core CPU with turbo boost speed up to 3.0 GHz. Utilizing the on-die HD graphics gives the BRIX native 4k display support and enough power to run a 3D blu-ray setup for compact and robust home theater PC purposes. The palm sized design also houses two USB 3.0 ports, Realtek HD 269 audio, Gigabit LAN, HDMI, and DisplayPort 1.2. Pop in an mSATA in the size of your choice along with some memory modules and you are set to go. The GIGABYTE BRIX lets you decide how you want to use the system to your advantage. 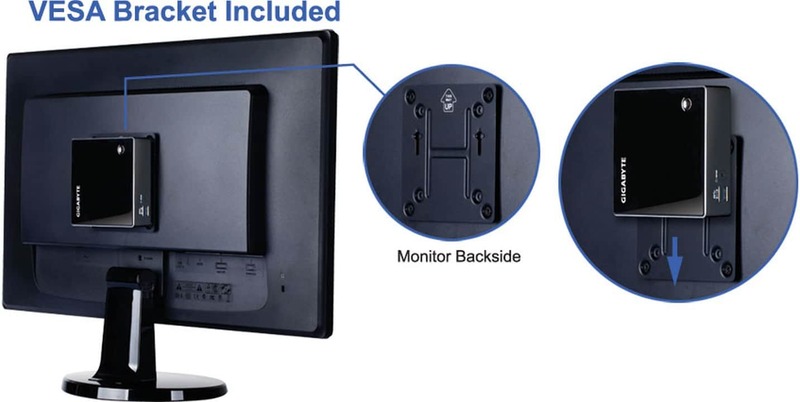 In fact, you can turn any monitor into an AiO computer with an incuded VESA bracket. Turn a router and external HDD into a home server. Or turn any hotel TV (with an HDMI port) into your desktop workspace on the go. Beside's INTEL's own NUC series of compact PCs, the BRIX really only has the ZOTAC Z-BOX to worry about. Or should ZOTAC be worried about the BRIX? No pricing and availability was announced but they shouldn't be too far off from current pricing of current units. Do check out the press release below for additional details. September 6th, 2013 - GIGABYTE TECHNOLOGY Co. Ltd., a leading manufacturer of motherboards and graphics cards, is proud to announce the next generation GIGABYTE BRIX compact PC kit with new models featuring the latest 4th generation Intel® Core™ processors. The new GIGABYTE BRIX is available in four models, each powered by the latest ‘Haswell’ architecture CPUs, offering improved CPU and graphics performance plus native 4K display support. The new GIGABYTE BRIX also features a front SPDIF jack and expanded USB 3.0 connectivity. 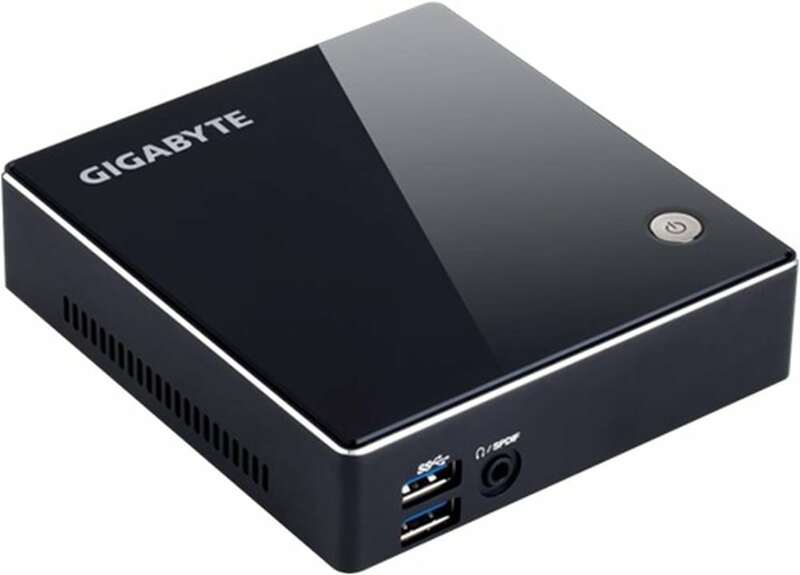 The updated BRIX from GIGABYTE redefines the desktop PC in terms of miniaturization with a sleek chassis design that sits snugly in the palm of a hand. With compact measurements of only 29.9mm x 107.6mm x 114.4 mm, the BRIX is a uniquely versatile DIY PC kit available with a broad choice of processors covering a range of performance and price points. The GIGABYTE BRIX doesn't hold back in terms display connectivity, networking or raw performance, and is ideal for compact HTPC builds, as a standard desktop in the home or office, or in commercial applications such as digital signage. GIGABYTE designed the BRIX to be smaller and lighter than currently available products, with a stylish glass surface mounted on an anthracite aluminum frame. The BRIX comes complete with a GIGABYTE compact form factor motherboard, Wi-Fi/Bluetooth 4.0 module, VESA mounting bracket and power adapter, and requires only an mSATA SSD, SO-DIMM memory and OS. The BRIX is available with a choice of four power-efficient, 4th Generation Intel® Core™ processors. From a simple Internet access point, to a discretely hidden multimedia station, the GIGABYTE BRIX offers great flexibility for a wide range of different usage applications. Display and Audio Connectivity: The GIGABYTE BRIX features both Mini DisplayPort and HDMI ports on the rear panel, supporting simultaneous dual display connectivity, making it suited to the work place, education and digital signage scenarios. With 4K resolution fast becoming the next technological milestone in high-definition content delivery, the GIGABYTE BRIX also supports the latest 4K displays via HDMI. The updated GIGABYTE BRIX also provides SPDIF audio connectivity via a front panel connector, useful in Home Theater scenarios that use a A/V receiver. USB 3.0 and Network Connectivity: The new GIGABYTE BRIX provides four USB 3.0 ports* (2x front plus 2x rear) offering improved connectivity for peripherals, storage devices and more. In addition to including a gigabit ethernet port, the GIGABYTE BRIX also includes a Mini PCIe module offering Wi-Fi b/g/n and the latest Bluetooth 4.0 connectivity, which makes the BRIX an ideal solution for connecting low power Bluetooth devices and peripherals, as well as allowing users to connect their mobile devices to their BRIX using freely available remote control Apps to provide mouse and keyboard functionality. VESA Support: Bundled with a VESA bracket, the BRIX can easily be mounted behind a monitor or HDTV making it discreetly hidden from view. This offers a simple and elegant way to turn any VESA-compliant display or TV into a full-featured PC or digital signage unit.